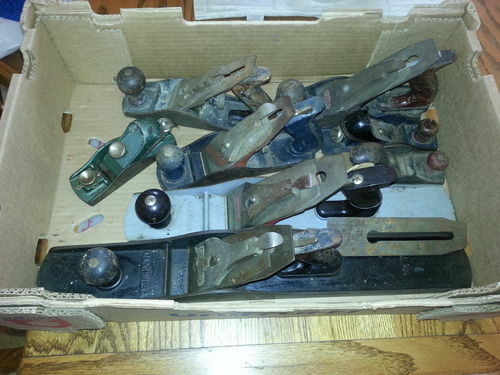 So I found a C/L post or the sale of 7 hand planes. The only one I was interested in was a Stanley #7, so I inquired. The seller said he wanted $110 for all of them. Hmmmmm, I thought. If I could get him down some more that’d mean I’d pay a little more than $10 per plane. I could restore them, remove all the rust, sharpen the irons, etc. and sell em each for $25 or more. Except the #7….I want to keep that one. A Stanley #55….with 37 cutters! I didn’t know much about that plane, let alone how to work all the adjustments so I told him I’d have to learn more about the tool and I’ll get back to him. I offered $75 and I’m wainting for a reply. So in the mean time I’m mixing up an electrolysis bath for the big box of planes and gonna let em cook. Stay tuned for progress and end results. Looks like a good haul there Doug. That 55 makes my head spin. With 37 cutters and the original tote and hot dog handle i think $75 is a good price on it. You should nab that #55 if you can. I hate fiddling with routers and all their loud noise, so I want one…bad. Good buy on the box full. If you get that #55 for your offer, it would be totally gloat-worthy. They generally go for at least $200-300 with all the cutters. Even missing some, $75 would be a steal. I’ve bought and sold for years and you definitely scored. You’ll do fine on those. Absolutely take the 55 even if you have to come up a little. 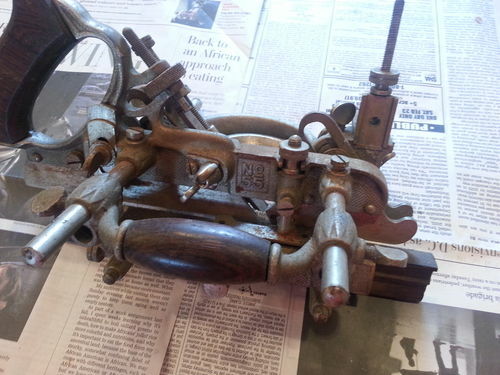 Back in the ‘80s I used to browse a great old flea market and there was this old guy there every week with what I’d have to call a museum of interesting vintage hand tools—all for flea market prices. I’d talk with him forever, but only bought a few tools from him. If I could go back I would buy him out most every week. That stuff was gold and it’s not getting any less scarce.